Here's a trade show that I wouldn't mind attending. 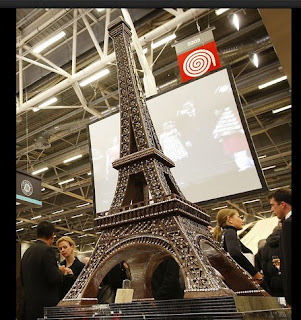 The French just kicked off the 14th Annual Paris Chocolate Show, celebrating all things cacao. Growers, producers and artisans gather to share their knowledge and products with the world. Can't make it to the City of Lights this week? The show moves to NYC next week at Pier 94, 711 12th Avenue and 55th Street. Two interesting Chocolate reads that I had fun with last year. Sweet-tooth waking up now? Scroll back a few days and you can learn how to make some chocolate marshmallows with Dani and MB. Me? I am going to go browse some cookbooks.